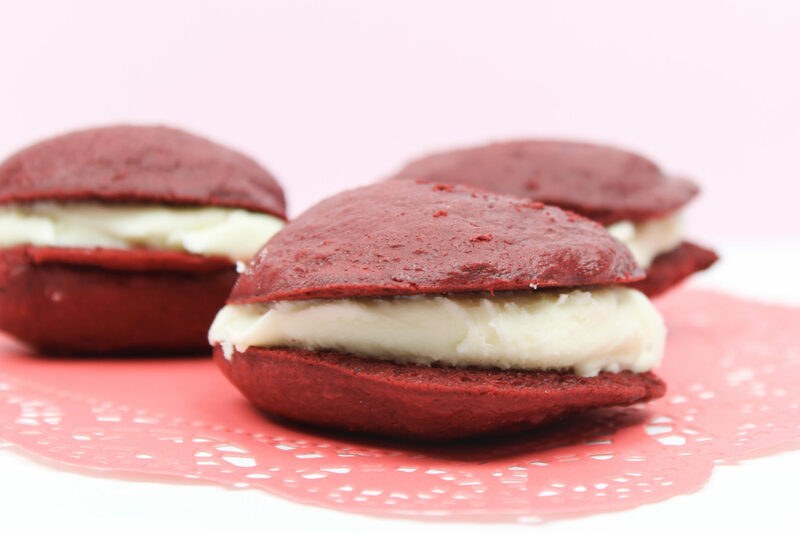 Impress Your Friends with these Red Velvet Whoopie Pies! 1. Mix the Red Velvet Cake Mix according to the directions on the box. Add 1 cup of flour to the mixture because that make the mixture a bit thicker – and that’s exactly the consistency you need for a good whoopie pie! 2. Drop spoonfuls of the cake mix on a cookie sheet, about 2 inches apart. 3. Bake them for 15 minutes at 350 degrees and be sure the let them cool completely. 4. Spread your desired amount of cream cheese frosting on one side of the whoopie pie and then top with another whoopie pie (to make a sandwich) and that’s it – your whoopie pies are now ready to be devoured. I know, this was kind of a shortcut because I used cake mix instead of making them from scratch, but hey – I am a busy mom. Sometimes I don’t have time for that and like I said, I did have the cake mix to use up anyways. I was really happy with how easy these were to make and believe me, they were delicious. Seriously! 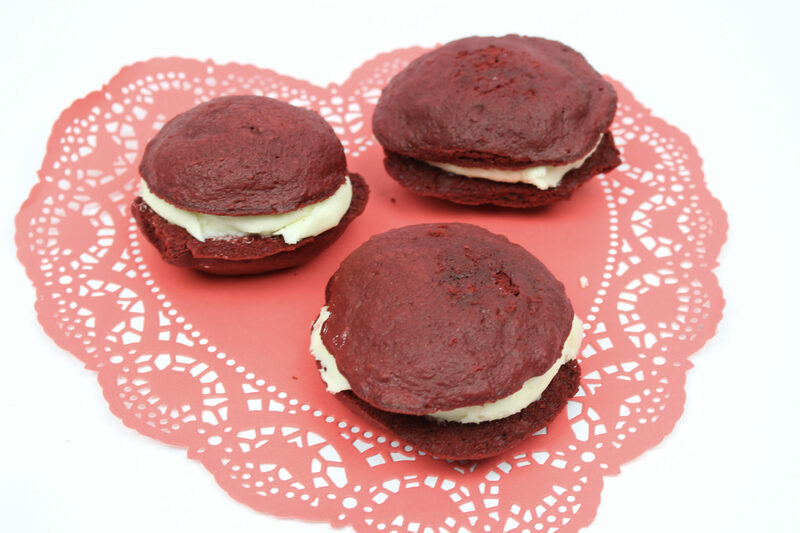 I hope you get a chance to make some Red Velvet Whoopie Pies for yourself! These are so simple to make and so delicious to eat! I love making cookies with cake mixes and a couple more ingredients. These look so yummy! 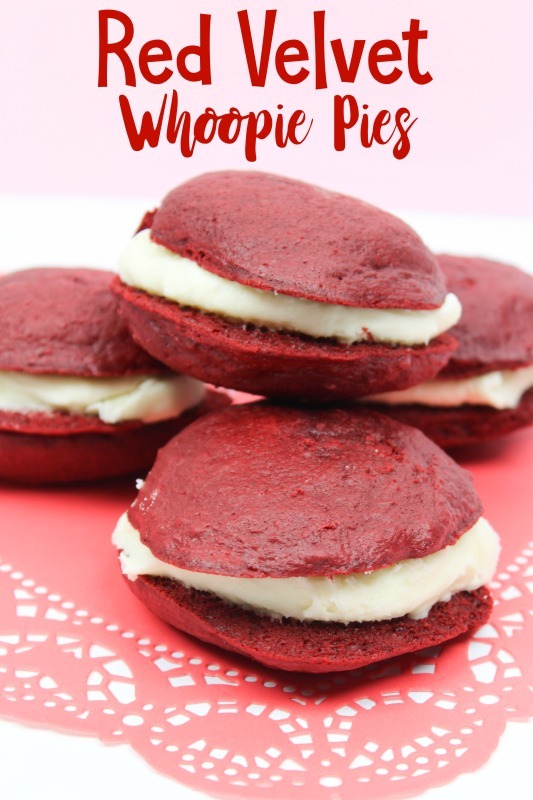 i love red velvet anything but never thought to make them into whoopie pies- this would be a huge hit at a friends party coming up! thanks girl! We always make red velvet around valentines day. Whoopsie pies are always a favorite and fun to make. What I like best about this recipe is the simplicity. I love red velvet ANYTHING! I love the tip about extra flour. That makes perfect sense. I am going to give that a try! Get in my belly! Those seriously look so good! Om nom nom. Aww this is the second Red velvet recipe I have came across today. The colors are perfect for Valentines Day. It looks so delicious on photos I have to make it asap now. I am so drooling with it. This would be a fun Valentines idea. It is cheap and it is delicious and I know my husband would like it. I love finding easy recipes using a cake mix. So cute and great for Valentine’s Day coming up. I love my buttercream instead of cream cheese though. Those pies are a simple recipe for a sweet treat that any family will love. I know red velvet and cream sandwhiches will be our next big favorite dessert. Those are the perfect treat for Valentine’s Day! I love the look, and I’ll be they’re tasty. Oh wow these look amazing! Red velvet cake is my absolute favourite but I’ve never had them in this way before. I am so going to try them! Wow, these whoopie pies look wicked good.I really need to figure out how to make these low-carb! These are such a tasty treat idea for Valentine’s Day! I cannot believe they are so simple to make. These turn out looking adorable and I love the simplicity of the recipe. I should definitely make some this year! These look so delicious! I might just make them for Valentine’s Day this year! Red Velvet is one of my favorites! This recipe would be perfect for me to make for Valentine’s Day. These look so yummy! I have never tried the red velvet version, but I’m sure it’s just as delicious. I’m all for some whoopie pies! They’re so good. Never thought to make it out of red velvet. I am looking for a recipe of red velvet and I bumped into this. I will definitely try this at home later! Thank you for sharing. OMG, these look amazing. I am a sucker for red velvet, so I am going to be making these! These seriously look so good! I’m going to attempt them as gluten free for the kids! What a fun idea! 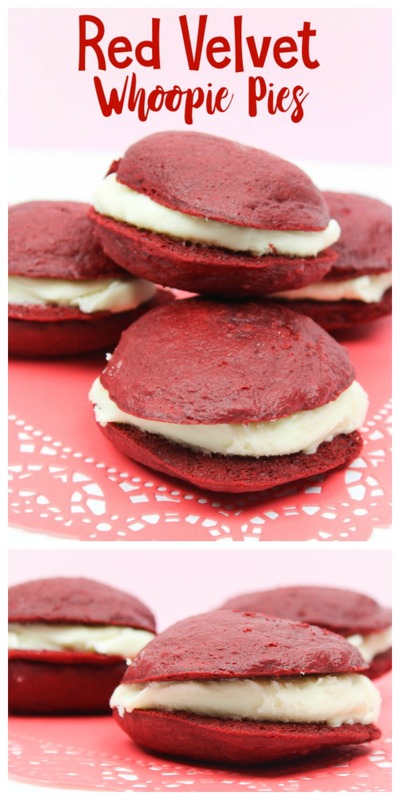 How cute are these red velvet whoopie pies! My kid will be happy to make these for Valentine’s Day! 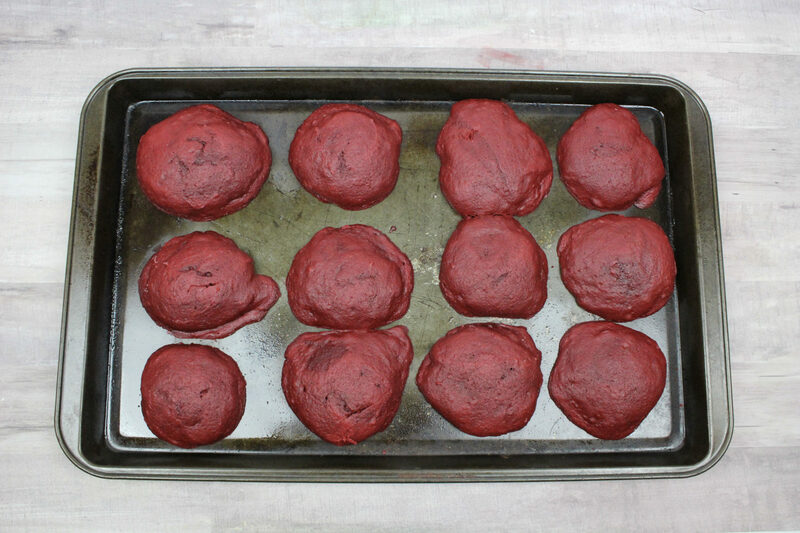 Red velvet is one of my favorite flavors, but I only had chocolate whoopie pies before. I would like to try this one day. 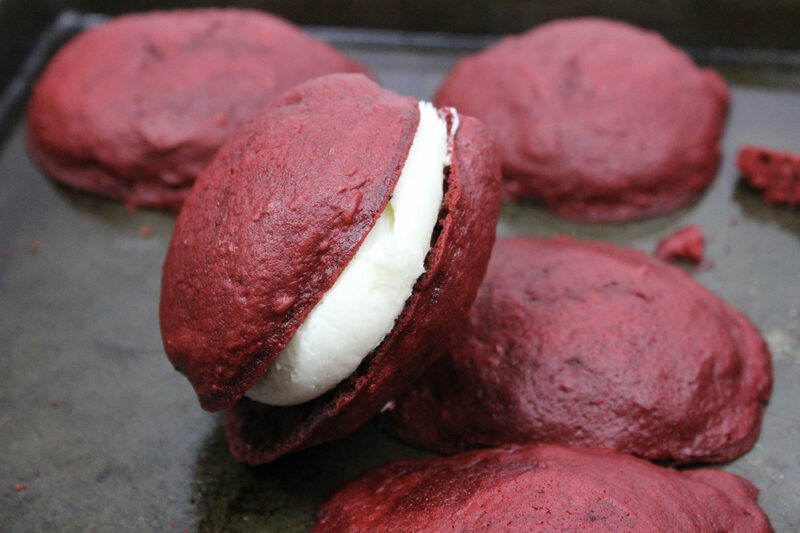 These red velvet whoopie pies look awesome. My son really likes anything that is red velvet. I have made chocolate whoopie pies before but never red velvet ones. These look really good! This whoopie pies look so fun and festive. I bet my kids would really enjoy these. Gotta make this recipe one day!